There are different kinds of rechargeable batteries. The most common type is the lead-acid battery. A less familiar one is the nickel-cadmium (NiCad) battery, which can still often be found in old emergency power systems. 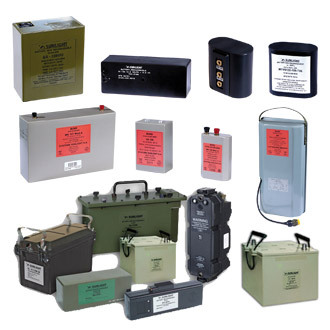 A battery is a device that stores electric power in the form of chemical energy. When necessary, the energy is again released as electric power for DC consumers such as lighting and starter motors. A battery consists of several galvanic cells with a voltage of 2 volt each. For a 12-volt battery, six cells are linked in series and fitted inside a single casing. To achieve 24 volt, two 12-volt batteries are linked in series. Each cell has positive oxidised lead plates and negative lead metal plates, and has an electrolyte consisting of water and sulphuric acid. During discharging, the lead oxide on the lead plates is converted into lead. The acid content decreases because sulphuric acid is required for this process. To recharge the battery, an external power source – such as a battery charger, alternator or solar panel – with a voltage of around 2.4 V per cell must be connected. The lead sulphate will then be converted back into lead and lead oxide, and the sulphuric acid content will rise. There are limits set for the charge voltage to prevent the release of an excessive amount of hydrogen. A charge voltage of more than 2.4 V per cell, for instance, releases a lot of hydrogen gas, which can form a highly explosive mixture with the oxygen in the air. Different types of battery– in terms of the thickness and number of plates per cell – correspond to different applications. The maximum current that can be delivered is determined by the total plate surface. The number of times that a battery can be discharged and recharged – the number of cycles – depends on the thickness of the plates. A battery can feature either many thin plates or a few thick ones.